2016 was a terrible year in so many different ways, but have no fear, tech is here for the rescue. Allow robotic AI-assistant voices to guide you through the remainder of the holidays, and into the promised land that is... The Future. Let boxes of computer chips soothe your wounded heart. Avoid the hell of Metro Manila traffic and enter virtual worlds instead. The year in tech was... just okay... but in plenty of ways, it was also crazy futuristic. At least we have some new toys to keep us busy after David Bowie left us to deal with Donald Trump on our own. 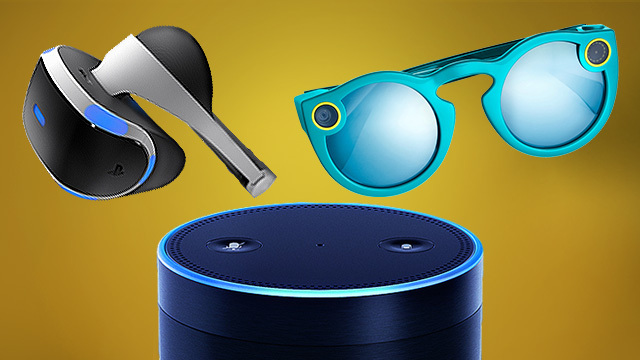 Here’s a short list of tech to acquire to future-proof your holidays. Did anyone say The Future? There's arguably nothing more futuristic right now than Amazon Echo—an Artificial Intelligence-enabled assistant that you talk to, just as you would your flesh-and-blood assistant IRL, yaya. Yes, the Echo is a plain speaker box that sits in your living room, but shout commands at it, and your assistant Alexa can control your tunes, check the traffic, call you an Uber, or Google things for you, you lazy sloth. Best of all, you can’t hurt Alexa’s feelings, unlike yaya. How can you make the iPhone even better? For starters, replace that bimbo Siri with Google Assistant and watch the magic happen. Google’s Pixel phone (and its big brother, the Pixel XL) doesn’t wander far from the iPhone formula for success, but with a few simple touches, it manages to somehow revolutionize the fancy phone segment. It also doesn’t hurt that the Pixel runs the best version of Android (Nougat), does VR with the Daydream View headset, and has probably the best camera you can get in a phone. The catch? Orders are backed up, so good luck finding one. 2016 was meant to be the year of virtual reality. And—hell yeah—we had not just the Oculus Rift, but the HTC Vive and PlayStation VR as well. When it comes to quality, the Rift and the Vive are tied for top place. The Vive is complicated to set up and use, but has Steam support. Meanwhile the Rift is a more slick experience with plenty of timed exclusive games. The PS VR is firmly in third, but it’s cheaper than the other two, which is a good good thing. Also, all you need is a PS4 instead of a gaming rig with all the bells and whistles. Killer games and killer apps are in woefully short supply, but there’s plenty to keep you busy until those (hopefully) come along. Fad or not, virtual reality just has to be experienced. If high frame rates and superior resolution are more your thing, you’ll need a video card like the Nvidia GTX 1060 to get your PC to work with an Oculus Rift or HTC Vive. Just like its big brothers (the GTX 1080 and 1070), the GTX 1060 is built on the Pascal architecture. That means it’s a quantum leap faster, cheaper, quieter, and more energy efficient than previous generation video cards. In short, this is the bomb. This is the one to get. Aside from VR, it’s also good for gaming at 1440p. Wheeee! It’s not all about tech specs though. This year’s most wanted Christmas gift is Nintendo’s NES Classic Edition. It looks just like the Nintendo Entertainment System your daddy had, except it’s smaller. It fits right in the palm of your hand. No need for gaming cartridges either. The Classic Edition comes with 30 pre-installed games, including Super Mario Bros 1-3, The Legend of Zelda, Metroid and Donkey Kong Jr. If you’re lucky enough to find one, just buy it, okay? Snapchat’s Spectacles remind us of yesteryear’s big failure, Google Glass, but they’re nothing like them. For starters, Spectacles only shoot (circular) video, post exclusively to Snapchat, and can’t shoot stills. They also look cool and are crazy fun—sorry, Google dorks. Now that Apple has “killed the headphone jack,” it’s a good time to look at wireless headphones that aren’t Apple’s own (lousy) earbuds. If you’ve got the cash, spot for wireless and noise-canceling headphones. You’re spoilt for choice. There’s Bose’s Quiet Comfort 35, or the Sennheiser Momentum Wireless if you’re made out of money. Or try Sony’s MDR-1000X. Upgrade your FB game. Yes, you too can post those amazing/annoying 360 degree pictures. All you need is a camera capable of shooting 360-degree photos. Try out the Ricoh Theta for starters.